Can’t wait to read Bright Before Sunrise, it looks fantastic! You know how much I love both books! Happy Bookiversary! Would love to win!! Thanks so much for the giveaway! 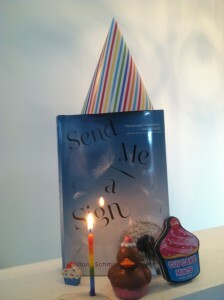 I absolutely loved SEND ME A SIGN, and cannot wait to read BRIGHT BEFORE SUNRISE! Congrats on the one year and thanks for the giveaway! Happy Bookiversary! Can’t wait to read Bright Before Sunrise! Hope to see you soon on your next book tour.